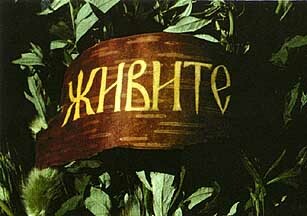 This word was the traditional Russian name for the letter Zh, which is not derived from the Greek alphabet on which most Russian letters were based. It apppears to have pagan origins. Zhivitye was sometimes drawn or sculpted as a five-branched Tree of Life. It closely resembles symbols of the rozhanitsy (birth faeries) who were carved and embroidered with arms flung wide and legs crouched like a woman in childbirth.